We are so lucky to be partnered up with some amazing sponsors and that includes Creative Successful Entrepreneurs! Melissa McFarlane of CSE hosted a workshop on how creatives can grow and sustain their awesome creative businesses! For this District Bliss DIY Workshop, we had Melissa McFarlane, CEO of Creative Successful Entrepreneurs lead this event. As a partnering company to District Bliss, we thought it would be a great opportunity for some of our current and new members to meet Melissa and share her experiences to help small, creative businesses thrive. The event was held at WeWork Manhattan Laundry, a shared work space for small businesses. During the workshop, attendees were given a exercise to meet one another and describe their business and share their vision for what they hope to see grow within their business. For instance, we had one local artist who provides calligraphy services for weddings and small gift projects, yet is looking for a way to grow their business and market it to the community. Most of the attendees at the workshop faced this similar challenge of how to market themselves in such a competitive market, and Melissa helped pave a way for attendees to see a clearer, more defined path of what they could do. Overall, attendees took away a lot of information from Melissa and we hope to have her again at future District Bliss events! Check out THESE awesome worksheets Melissa took us through! These are perfect for mapping out your website, whether you’re creating your first site ever or want to revamp! 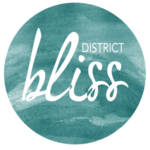 Stay up to date with us to find out about rad future events at districtbliss.com/events!